Samsung has released a few new smartphones under the company’s update A-series. So far, the company has launched Galaxy A10, A20, A30, A40, and A50. Now, the South Korean giant is expected to launch Galaxy A90 smartphone at a launch event on 10th April. Ahead of the official launch of Galaxy A90, it has now been confirmed that the smartphone will feature a notch-less Infinity display as the company has teased this feature in a new image. This means that the device won’t feature any kind of punch-hole or cutout on the display for the front-facing camera. Thus, the device could be the company’s first smartphone to feature a pop-up mechanism to house the front-facing camera, similar to what we’ve already seen in the recently launched Vivo V15 series smartphone and the Oppo F11 series devices. 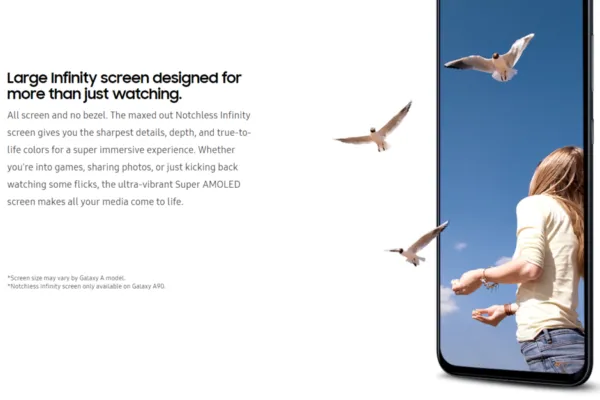 This will make it the first Samsung smartphone to come with notch-less Infinity display. According to the rumors, the smartphone will be powered by the 10nm Qualcomm Snapdragon 710 octa-core chipset, coupled with Adreno 616 GPU. It will pack 8 GB of RAM and 256 GB of internal storage. In the software department, the phone will run Android 9 Pie OS out-of-the-box. Rumors also suggest that the smartphone will feature a quad-camera setup on the back. While the phone’s pricing has not been revealed, it is expected to be the most expensive smartphone in the Galaxy A lineup.